Indians love queues. Despite the diversity, there is nothing that aligns all Indians like a long line. The image of Indians standing in a queue is the national symbol. In India everywhere you go, every situation you encounter, every activity you attend there is a queue waiting for you and plenty of Indians waiting in the queue. Indians are born with the gift of forming queues, and they never miss a single opportunity to do so. 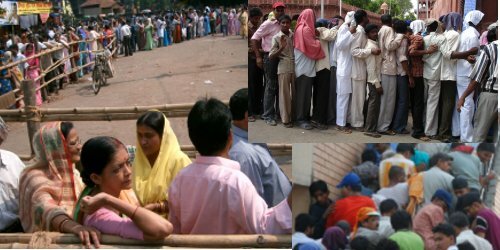 Opportunities are abundant in India; queues are ubiquitous. The unique ability of Indian fetuses to form queue inside the womb is the key to population boom. Indians never grow out of it and spend approximately half of their lives waiting in a queue. The other half they spend waiting to join one. Bargain may be just a skill in most part of the world, but in India is an art form. It takes years of practice under the supervision of skillful masters, such as your experienced grandfather, your fast talking aunt, or your street smart uncle. What separates a mere skill from an art is the passion. Indians bargain with passion. While the rest of the world may be happy with simple financial advantage, we seek a deeper joy in a good bargain. Bargain in India is a battle of wits: it tests our cunning, our verbal skill, our ability to think on our feet, and our desire to win. The battled is waged everyday, at every street corner, in every store with every hawkers and shop keepers. We even bargain when we bribe. Most of the times, it has little to do with financial gain. Rather, most of the times it has to do with little financial gain. Yet, for the believers of the art it is a matter of principle.